There is a lot of info out there on the net about watering your succulents, more specifically over watering your succulents. 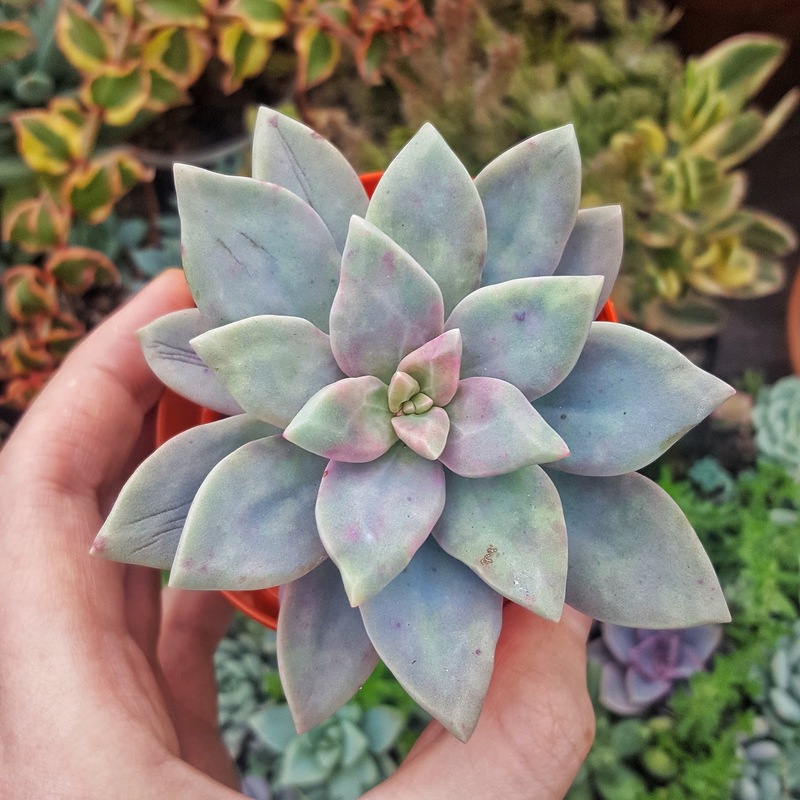 I'm sure you know at this stage that over watering is one of the cardinal sins against succies and it's a sure fire way to ensure your succulent ends up in a less than ideal state. But succulents do need watering so how do you know watering is needed or when you are just going to lead your plant to a slow watery death? A well watered succulent will have plump, firm leaves. When you squeeze them between your fingers there should be very little give. If they are soft then they probably need watering. Another sure sign is wrinkled leaves, when they are feeling thirsty their leaves pucker and wrinkle. You'll often hear 'only water when the soil is completely dry'. This is true but sometimes if your plant is taking up most of the pot or you have a topdressing it can be difficult to tell when the soil is dry, remember you want to make sure that the soil is dry throughout the whole pot not just on the top. My tried, tested and very scientific method of checking whether or not my plants need water is picking up the pot. Get to know your plants, after a while you will be able to tell by the weight of the pot whether or not the soil is dry. Obviously a pot with dry soil is going to weigh a lot less than a pot with wet soil. So pick up your pots after you have watered them, feel their weight, pick them up when they are dry, again feel the weight. After a while it will become second nature and you will just know when your plant needs a drink. Another easy method is to use a wooden skewer, stick it down into the soil, if it comes out clean and dry then chances are your soil is dry and your succulent needs watering. If it comes out dirty and wet then your succulent is fine for the time being. If you want an actual scientific method you can buy water meters, you can find them in garden centres or on amazon. These should leave you in no doubt about whether or not your plant needs watering. Always remember when watering your succulents they need a good soaking, water them until water runs out of the drainage holes. A little spritz isn't enough. So there you have it, how to check if your succulent needs watering. 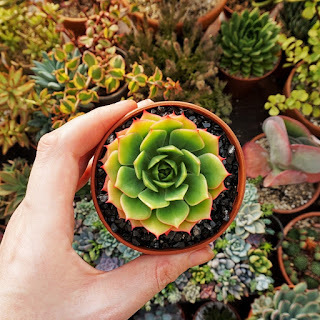 Do you have a favourite method to check if your plants need a drink? I'd love to hear about it if you do! 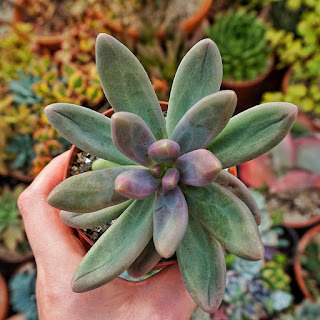 You can leave a comment below or find me across various social media posting pictures of my plants, the links for these are in the sidebar. I think it's worth mentioning that soaking the soil in the winter can be a bad idea, particularly if you're using a bagged cactus soil mix and your winters are cloudy and damp. Ask me how I know... A light watering is fine until spring comes and the plants break dormancy. I now amend the bagged soil to improve the drainage as it's way too water-retentive, even if it's supposedly for succulents. Perhaps for people in hot, dry climates it's a different story, but I grow my succulents on a window sill in a grey, cool one.